Now Prada on the other hand is an entirely different story. I tried on the shoe in this color and it was really narrow for me in the front and the bow was overwhelming. Just not my cup of tea at all. (image via nordstrom.com $390) Which do you prefer? I like the look and color of the Prada pair but the MIu MIus are so unique! I love Miu Miu flats! I just wish the bottoms were more reinforced. Leather soles wear out so quickly! Love the pair with the bow! I think they're both really cute! Love these! I am a big fan of bows. adore the shoes, but the prices would blow up my bank account. HAHAHA Love them! I feel like Miu Miu has really upped their game lately. Their shoes are amaze balls this season! That blinged out heel is adorable. Super cute! 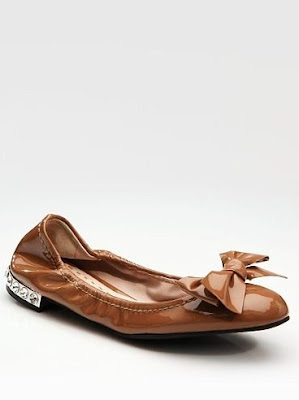 I love bows on flats - the bling is a little much for me but still super cute. The Miu Miu ones are amazing. I love the colour. These flats are so adorable! Bee bee bee it beige! DYING. Those Miu Mius are killer! I need some good flats right now! These are so cute!